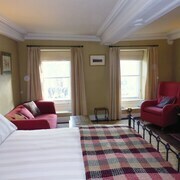 Situated in Brecon, this bed & breakfast is 0.5 mi (0.7 km) from Brecon Cathedral and 3.9 mi (6.2 km) from Pen y Fan. The best of Brecon Beacons National Park in Wales. Opens in a new window. The house is very welcoming, and full of history as well. Anne and the staff are extremely gentle and make you feel comfortable. The breakfast is really good as well, and there is a lot of space in the house as well as outside. Nearby the village is really cute, and the leisure center provides many activities for the kids. Where to find Brecon hotels near an airport? 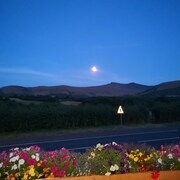 Where can I find hotels in Brecon that are near tourist attractions? 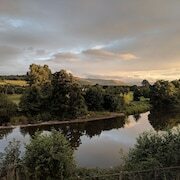 Spending several days in South Wales and want to stay near central Brecon? Within a 0.1-kilometre (0.06-mile) distance of the heart of town, you can find 4 Expedia-listed apartments and hotels. The Old Castle Farm Guest House is amongst the most convenient options as it is one of a handful of options within an easy stroll of the Brecon downtown area. The The Usk Inn is a budget-priced hotel. 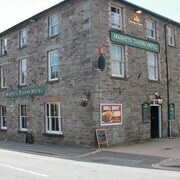 You will find it conveniently situated 12 kilometres (7 miles) from the heart of Brecon. Another no-frills option in this area is the Pen-Y-Bryn House. 20 kilometres (12 miles) from downtown Brecon, is the Lake Country House Hotel & Spa. Alternatively, the Llangoed Hall is located 14 kilometres (9 miles) away. 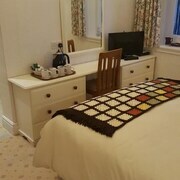 Another option is to check out the amenities and rates at the Peterstone Court or the Gliffaes Country House Hotel. 30 kilometres (20 miles) away from Brecon you will find Abergavenny, where you can spend the day visiting Abergavenny Museum and Castle and Borough Theatre. 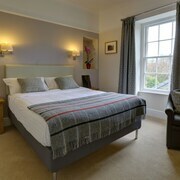 Some of our recommended Abergavenny hotels are the The Angel Hotel Abergavenny and The Park Hotel. 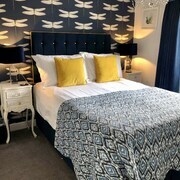 Or stay in Mumbles, 60 kilometres (36 miles) to the southwest of Brecon, where you can choose from the Cafe Valance Bar & Rooms and Norton House Hotel. The Gower Surfing School and Brandy Cove are a couple of the popular points of interest to see in Mumbles. If watching sport is your passion, make the time to visit Millennium Stadium, which is 55 kilometres (35 miles) to the south of Brecon. Sports fans wanting to stay close by can choose from the The St David's Hotel or the Hilton Cardiff. Cardiff International Airport can be found 60 kilometres (39 miles) from Brecon. Visitors who wish to stay close by, can book a room at the Holiday Inn Express Cardiff Airport or the Three Horseshoes. What are the most popular Brecon hotels? Are there hotels in other cities near Brecon? What other types of accommodations are available in Brecon? Explore Brecon with Expedia.ca’s Travel Guides to find the best flights, cars, holiday packages and more!